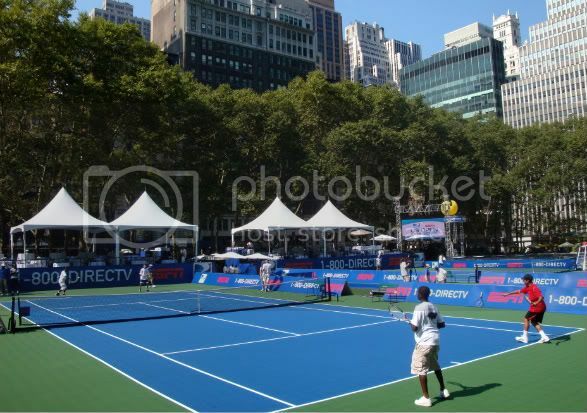 Yesterday’s US Open Experience in Bryant Park was a crowd pleasing event, thanks to DIRECTV, ESPN, and the tennis pros who braved the sun’s scorching rays to spend the day in the park. 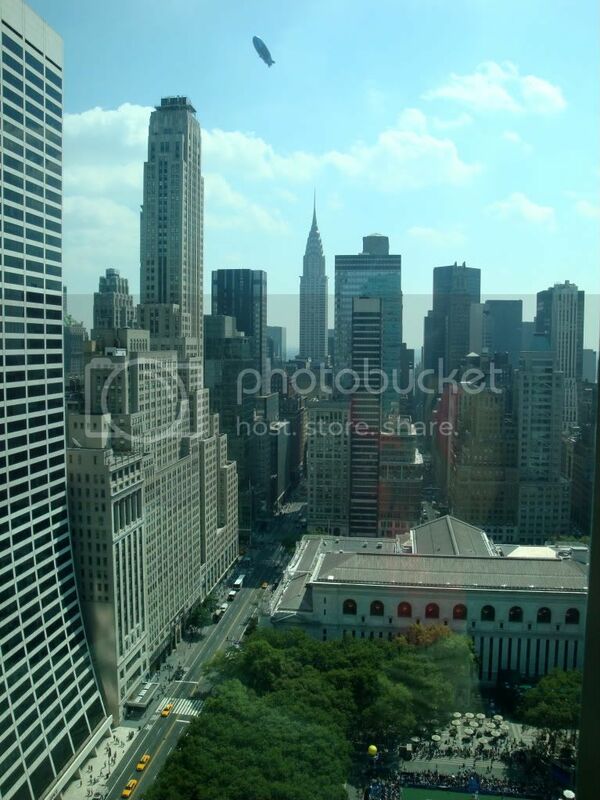 The midtown location made some of the world’s best players and a US Open atmosphere accessible to all. 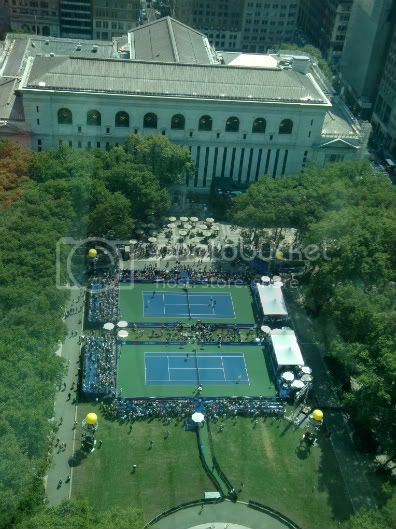 Two US Open regulation courts were constructed on the lawn over the course of 35 hours. Kids from the Harlem Junior Tennis & Education Program played for the gathering crowd as the event began. 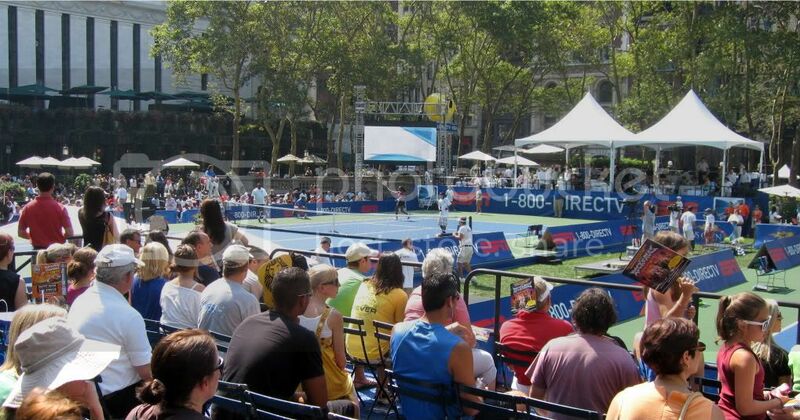 Games took place on two different courts at the same time to demonstrate DIRECTV’s upcoming coverage of simultaneous US Open matches all on one channel. The Jensen brothers, Murphy and Luke, were the first pros to take the courts (left), followed by Victoria Azarenka and Mary Jo Fernandez (right, wearing blue and pink, respectively). 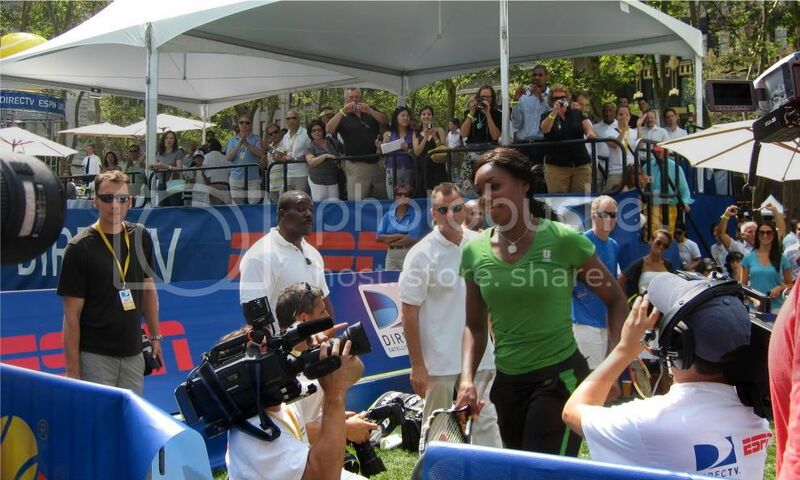 Fans leap to their feet as Venus Williams entered the arena. Tennis legend John McEnroe showed off his swing in a game against James Blake. 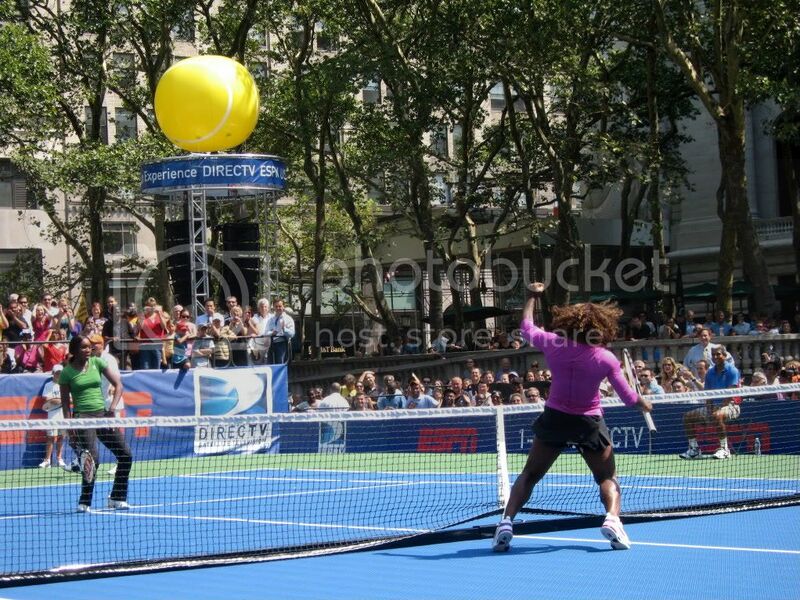 The Williams sisters and Jensen brothers competed in a playful sibling mixed doubles match. 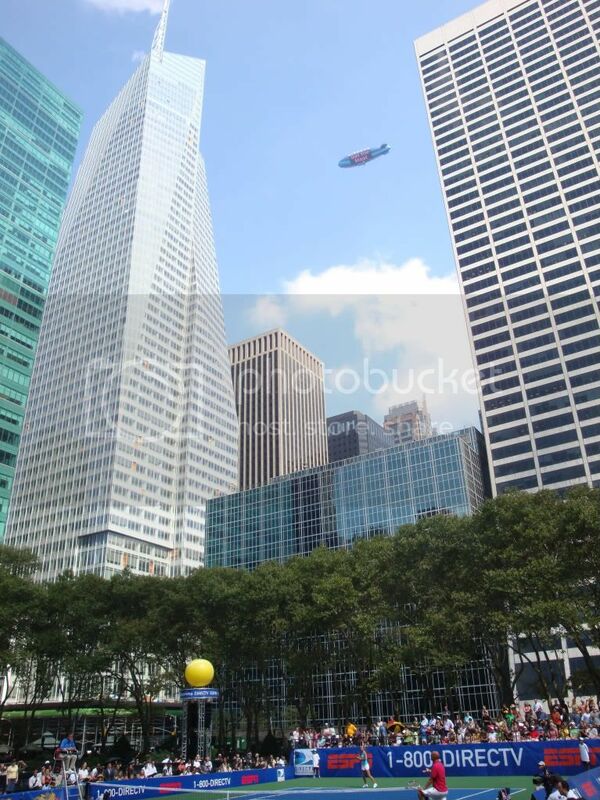 and the DIRECTV blimp circled the sky above the park throughout the day. 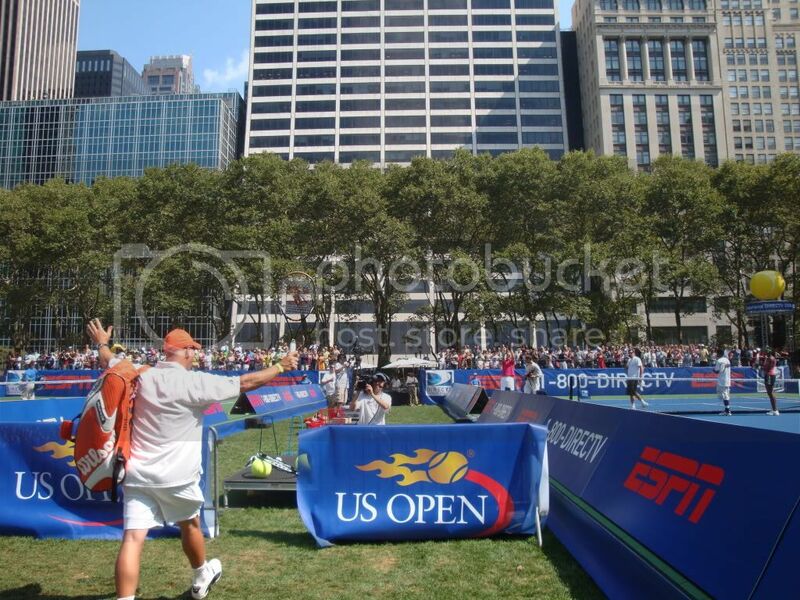 Former tennis champion, Justin Gimmelstob, and pro-turned coach, Brad Gilbert, were also in attendance, along with sportscaster Bud Collins, who interviewed players for the audience as they left the courts. To wrap up the festivities, members of the public were invited to compete in various skills challenges, and 12 pairs of US Open tickets were awarded to the best of the bunch.